This week’s update is slightly later than usual as we have been away looking for new recruits at the Goffs Orby Yearling Sale in Ireland. Unfortunately, we came home empty handed, so it is on to the Tattersalls October Yearling Sale Book 1 next week, where we hope to find some stars of the future. This year’s two year olds have done us proud, and was Glorious Rocket who notched up individual juvenile winner number six when winning maiden at Kempton last Wednesday under Adam Kirby. He has a mixed pedigree, by Bated Breath out of a 15 furlong winner, but he clearly takes after his sire winning nicely when dropped back to six furlongs. At home we have worked on teaching him to settle in the two months since his last race so it was nice to see the hard work pay off. He is clearly versatile with regards ground and we shall talk to his owner about whether we go for a nursery or put him away for the year. His opening mark of 80 is not particularly lenient; neither is the 76 which has been handed to City Limits or the 74 given to Rickrack, though we feel all three will make three year olds, with the latter pair bred to be suited by middle distances. 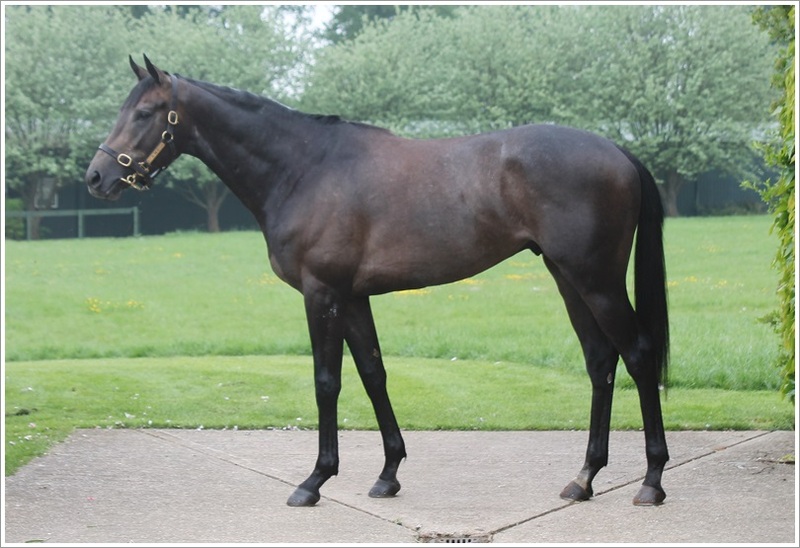 We struck again with another two year old this Wednesday evening when Fittocks Stud’s Total Star (pictured) put his low key Solario Stakes run behind him by winning a four runner novice at Kempton. We thought we were third best on form going into the race so we very pleased to see him win nicely under Ryan Moore. We may give him one more run before putting him away for next season where we hope he will develop into a smart middle distance horse. Our two runners at Pontefract last Thursday included Pacharana and El Vip who were both placed. Each finished some distance behind the winner but were better than the bare result having been set a lot to do. There is no doubt that Pacharana should have raced much closer to the eventual winner but do not forget it was only Gabriele Malune’s fourteenth ride and we are sure he will have learnt plenty from the experience. Also, it is hard to say if we would have beaten the winner anyway as he was a Prescott special—although who knows what the trainer thought of winning a handicap by 18 lengths! As we said at the time, El Vip’s debut win did not warrant an opening mark of 90 and he has rather paid the penalty for that on both starts since. However, we still feel he has the potential to do better in time as his dam only made her debut in the May of her three year old year and went on to win Group 1s at three, four and five. Shakopee was disappointing for the second start in a row at Newmarket when losing his race on the way to the start after fighting with his jockey. We had four runners at Newmarket on Friday and, while there were no winners, Laurence ran another sound race to finish fifth of twenty in the Silver Cambridgeshire and two year old Red Label made a good debut when third in a maiden. Red Label has been green at home, and it was the same story on the track, but he finished with purpose after he grasped what was required and will hopefully improve plenty for that run; we see Timeform have given him the large ‘P’. Second Step wore blinkers again in the Listed Mukhadram Godolphin Stakes but unfortunately they did little for him. We will sit down with his owner Merry Fox Stud now and discuss his future. Beautiful Morning was well backed for the Listed Princess Royal EBF Nayef Stakes but we thought she might need the run after four months off and so it proved. We expect Beautiful Morning to stay a mile and a half in the future provided she settles. Tiptree was a non-runner in the same race because of the ground. Banksea was sent off favourite for the Cambridgeshire at Newmarket on Saturday, which was a surprise to say the least. He has been a steadily progressive three year old this season but there was no obvious reason why he should have been market leader for such a competitive handicap. In the event, he blew it at the start as he became anxious in the stalls and that is the second time this year he has run below form at Newmarket. Rickrack and Pincheck ran at Haydock on Saturday and neither were disgraced, the former finishing third on her third start and the latter finishing fifth on his debut. Unfortunately, Testimonio finished well beaten on his handicap debut at Epsom on Sunday and was probably still green given he beat just three rivals on his debut. Again, we did say we felt he had been given a stiff mark for what he actually achieved at Brighton. Al produced his best performance of the season when returning to a mile and three quarters when third at Wolverhampton on Tuesday and could do even better over two miles. He is now likely to go the upcoming Horse In Training sales at Tattersalls. We were looking to run Loving Things in the Group 2 Prix de Royallieu this weekend but that plan has been shelved as the ground is currently on the firm side and we know she prefers it much softer. We could still have a runner in France, however, as Very Dashing could go in the Listed Prix Charles Laffitte at Maisons-Laffitte on Monday. We are also pleased to report that another of our good fillies, Aljezeera, is now fine after a bout of coughing ruled her out of the May Hill Stakes. It is not guaranteed that she will run again this year as there are not many options left for a filly like her, though perhaps the Listed Montrose Stakes could come under consideration.